Insect Sting Allergy is not affecting the majority of people. spotting the difference between an allergy and a regular reaction will lessen anxiety and save you needless medical cost. Lots of people enter hospital emergency rooms or urgent care clinics every year stricken by insect stings. it has been estimated that potentially life-threatening allergic reactions arise in 0.4% – 0.8% of kids and 3% of adults. at least 90 – 100 deaths per year result from insect sting anaphylaxis. At Aashwas Chest & Allergy Clinic we have experience Allergist who can provide treatment for Insect Sting Allergy and can provide a guideline for avoiding future exposure. The severity of an insect sting reaction varies from person to person. A local reaction will result in ache, swelling, and redness limited to the sting site. you can disinfect the place (washing with soap and water will do) and apply ice to reduce the swelling. A large local reaction will result in swelling that extends beyond the sting site. 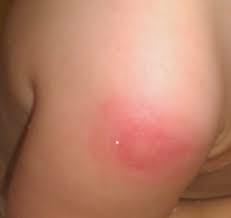 as an example, a sting on the forearm should result in the whole arm swelling. although alarming in appearance, this situation is regularly handled the same as a regular response. A surprisingly painful or very massive local response may also need medical attention. due to the fact this condition may also persist for 2 to three days, antihistamines and corticosteroids are sometimes prescribed to reduce the pain. An allergic reaction that results in symptoms other than localized swelling. Symptoms may include itching, hives or swelling away from the sting site. This type of reaction may progress to anaphylaxis. Anaphylaxis is a life-threatening allergic reaction which can include tightness in the chest and difficulty breathing, throat tightness, dizziness, a sharp drop in blood pressure, unconsciousness or cardiac arrest. If you have auto-injectable epinephrine, use it immediately. Then seek immediate medical attention. Your allergist may perform one or more tests to diagnose allergy to insect venom, such as a skin-prick test, an intradermal skin test or a blood test. In the skin-prick test, a small amount of a liquid containing insect venom is placed on the back or forearm, which is then pricked with a small, sterile probe to allow the liquid to seep into the skin. If a raised, reddish spot forms within 15 to 20 minutes, that can indicate an allergy. In the blood test, a blood sample is sent to a laboratory to test for the presence of immunoglobulin E (IgE) antibodies to insect venom. If the skin prick test is negative or inconclusive your allergist will likely recommend an intradermal skin test, in which a small amount of venom extract is injected just under the skin. The site is examined after about 15 minutes for signs of an allergic reaction. This test is considered more accurate than the skin-prick or blood tests in determining the presence of IgE antibodies. If both skin prick and intradermal skin tests are negative then your allergist may recommend a blood test. Injectable epinephrine for self-administration is often prescribed as emergency rescue medication for treating an allergic reaction. People who have had previous allergic reactions and rely on epinephrine must remember to carry it with them at all times. Also, because one dose may not be enough to reverse the reaction, recent guidelines recommend keeping two doses of injectable epinephrine available and to activate emergency medical services if used. Even if symptoms improve after a single dose of epinephrine, immediate medical attention following an insect sting is recommended.